For Beijing locals, we can roam in the Forbidden City anytime we want. For visitors, it is a must-go when they come to Beijing. For foreigners living in Beijing, they probably tour the Forbidden City every time they get a visit from their friends or relatives. However, regardless if it is your first time or hundredth time visiting the Forbidden City, it is better to know HOW to tour the Palace Museum. Almost every visitor coming to Beijing visits the Forbidden City for its worldwide fame as well as its cultural significance. The beauty of the palace lies in its unique architecture and valuable antiques as well as its history of emperors and their stories. People who lived in the Forbidden City have long passed away, but their stories are passed down from generation to generation. All memories of the Forbidden City have been precipitated for over 600 years in this grand palace. Time changes, but the Forbidden City always keeps its charm in its own way. In spring, flowers of different colors blossom behind the red walls. In autumn, the Palace is filled with golden leaves. Yet winter is the favourite season for many people; as a poem reads, “red walls are covered with white snow, crystal jade falls down flake by flake”. I’ve been living in Beijing for my entire life. Every year when it snowed, I came to the Forbidden City with my camera to capture its beauty and immerse myself in its timeless history. The Forbidden City covers an area of 720,000 square meters (about 180 acres) and its floor area is about 150,000 square meters (about 37 acres) with over 70 palaces of different sizes. So it will take you at least one day to visit this huge complex, residence of past emperors and political center of the Chinese civilization for many centuries. With some good planning, a bit of knowledge in Chinese history, even better if you watched some Chinese drama series, you will sure enjoy your tour of the Forbidden City. It might be better to listen to an audio guide while touring the complex because you might feel bored just walking around without knowing the context of different attractions. People may have different walking paths in the Forbidden City, here I want to recommend four paths with you. 1. Route one (marked in yellow): Meridian Gate - Taihe Palace - Hall of Central Harmony - Hall of Preserving Harmony - Palace of Heavenly Purity - Hall of Union and Peace - Palace of Earthly Tranquility - Imperial Garden - Gate of Divine Prowess. 2. Route two (marked in green): From Central axis to the east route. Chengqian Palace - Palace of Eternal Harmony - Palace of Great Benevolence - the Crystal Palace - Hall of Clocks and Watches on the External Eastern Road - Jewel House - Imperial Garden. 3. Route three (marked in blue) Central axis. Privy Council - Palace of Compassion and Tranquility - Hall of Longevity and Good Health - Hall of Taiji - Palace of Earthly Honor - Palace of Gathered Elegance - Imperial Garden. 4. Route four (marked in purple at the Meridian Gate): Wild Goose-Wing Floor at the Meridian Gate. The main hall of the Forbidden City is the most wonderful place where everyone has to visit. The visiting route: Meridian Gate - Taihe Palace - Hall of Central Harmony - Hall of Preserving Harmony - Palace of Heavenly Purity - Hall of Union and Peace - Palace of Earthly Tranquility - Imperial Garden - Gate of Divine Prowess. Suitable for: both the old and the young as well as those who are in a rush because it goes through the most essential spots in the Palace in about 2 hours. Administrative areas of emperors: Taihe Palace, Hall of Central Harmony and Hall of Preserving Harmony. The three main halls were administrative areas of emperors, which were Taihe Gate, Taihe Palace, Hall of Central Harmony and Hall of Preserving Harmony. The Taihe Gate was where emperors listened to administrative affairs from officials. Taihe Palace was where the morning court was held, which was also called emperor’s audience hall. Hall of Central Harmony was where emperor’s family history was kept. Hall of Preserving Harmony was where all the scholars looked forward to since the final imperial examination was held here triennially to select emperor’s students. The Front Court represented the emperor’s rule of power, almost all visitors pay a visit here. The overall architectural layout of the Forbidden City follows a central axis with bilateral symmetry. The best spots to view and take photos are Taihe Palace Square, Hongyi Tower and Tiren Tower. The 308 large water tanks in the Forbidden City also add a sense of aesthetics to the place apart from their original functions of fire fighting. In 1900, Beijing was invaded by the Eight-Power Allied Forces, during which these water tanks were also damaged since many invaders tried to scrape gold from the gilding-copper tanks. Even today we can see the cuts they left. Residential palaces in the backyards: Hall of Preserving Harmony, Hall of Central Harmony and Palace of Heavenly Purity. Walking down from the steps of the Hall of Preserving Harmony, you can see the inner left door, Qianqing Gate and inner right door. Inside the doors are the imperial palace for the emperor and his family, which was also called the imperial harem. After entering the Qianqing Gate, people can still visit along the traditional central route. The Qianqing Palace was the residence for emperors before Emperor Yongzheng. The Palace of Earthly Tranquility was the residence of empresses in the Ming dynasty. In the Qing dynasty, it was turned into a place for the rituals of Shamanism on the left and emperor's wedding room on the right. The Hall of Union is between Qianqing Palace and Palace of Earthly Tranquility, representing harmonious peace of the emperor's family. Gardens: Generally, visitors will go to the Imperial Garden directly after visiting the three palaces and then finish at the Gate of Divine Prowess. But ending your tour of the Forbidden City here would be a pity since this 720,000-sqaure-meter complex has a lot more interesting attractions to see. Along this route, you can visit the three Palaces, go over the love story between Emperor Shunzhi and Empress Xiao Xian and explore the secret of Zhen Fei Well. The route: From the central axis to the east route. Chengqian Palace - Palace of Eternal Harmony - Palace of Great Benevolence - the Crystal Palace - Hall of Clocks and Watches on the External Eastern Road - Jewel House - Imperial Garden. Suitable for: those who are interested in history. Six palaces in the east: Palace of Great Benevolence, Chengqian Palace, Zhong Cui Palace, Hall of Justice, Palace of Eternal Harmony, and the Crystal Palace. The six palaces are located in the east of the Hall of Union where emperor’s women lived. When you enter these courtyards, think about the plots and characters you read from history books or movies, then you can feel like you travelled to the past. Currently only four of the six palaces are open to the public. (1) Zhongcui Palace was once the palace of Ci’an empress. Maybe you have no idea who Ci’an was, but you probably have heard of Cixi, the famous empress towards the end of Qing Dynasty. So what's the relationship between Ci’an and Cixi? Usually Cixi was called the West Empress Dowager and Cian was referred to as the East Empress Dowager. Cixi was a concubine of Emperor Xian Feng and she was the mother of Emperor Tongzhi; while Ci’an was the empress of Emperor Xian Feng without any child. After Emperor Xian Feng's death, Tongzhi inherited the throne and both Cixi and Ci’an became Empress Dowager according to Xian Feng's imperial edict. (2) Hall of Justice was the residence of Emperor Taichang's mother. Do you know Emperor Taichang? Yes, he was the main character of the Red Pills Case, one of the top three cases at the end of Ming Dynasty. Currently this hall isn’t open to public. (3) Chengqian Palace was once the residence of Xiao Xian, the empress of Emperor Shunzhi. In the TV series Empress Xiaozhuang, the role of Xiao Xian was interpreted by actress Shu Chang perfectly. Throughout history, among all the emperors, the love story between Emperor Shunzhi and Empress Xiao Xian was quite touching, apart from the beautiful love story between Yang Yuhuan and Emperor Li Longji during the Tang Dynasty. (4) Palace of Eternal Harmony was once the residence of Emperor Yongzheng's birth mother. However, she didn’t live in the Palace of Compassion and Tranquility likes other empress dowagers. (5) Palace of Great Benevolence was once the residence of Empress Hu and also concubine Zhen, Emperor Guangxu's favourite concubine who was thrown into a well by Cixi to preserve royal dignity. (6) Yanxi Palace was the residence of Ling concubine who is very familiar to many people because of the famous TV series “Story of Yanxi Palace”. Concubine Ling was once a maid in the Palace, but she became the hostess of the imperial harem and gave birth to Emperor Jiaqing. (1) Jewel House is a treasure house filled with various gems, shining gold and silver vessels as well as pearls and jade, etc. Going along the narrow lane, you can visit the Palace of Taishang Huang (retired emperor) after leaving the Yanxi Palace and turn left. At the age of 86, Emperor Qianlong retired from the throne and abdicated to his son, Emperor Jiaqing. Then he built a house for himself to enjoy his senior life. That is the Jewel House. The whole Palace of Peace and Longevity is an epitome of the Forbidden City. The most essential antiques are reserved here, such as the nine-dragon wall, the three-linked seal, hair-crystal snuff bottle, different kinds of decorations, 25 precious seals of Emperor Qianlong as well as the five-ton jade carved to depict the legend of Da Yu. (3) Zhen Fei Well is not just a well, it signifies the decline of a dynasty to some extent. Turn left at the exit of Jewel House and go straight, you can see the Shunzhen Gate and Gate of Divine Prowess. Inside the Shun Zhen Gate is the imperial garden, and the Gate of Divine Prowess divides the Forbidden City from the rest of Beijing. Let's explore the places where people played in the TV series “Empresses in the Palace”. Suitable for: loyal fans to the TV series “Empresses in the Palace”. (1) Privy Council was an institute of consultation set after Emperor Yongzheng. It was an organ of central power in the dynasty. (2) Palace of Compassion and Tranquility was once the residence of empress dowager Xiao Zhuang who was the empress of Emperor Taizong. (3) Palace of Longevity and Good Health. It seems that women have always lived longer than men since ancient times. Imperial Concubine Xi of Emperor Yongzheng, the biological mother of Emperor Qianlong all lived here. Concubine Xi died at the age of 86. She once went to the North of Mongolian Plateau Desert, visited Shandong and south of the Yangtze River and climbed Mount Song and Mount Yue together with her son. She enjoyed a splendid life with all the great wealth. However concubine Chen lived the longest here; she was the wife of Emperor Qianlong. She was once the most unremarkable character, but she lived 92 years. The six palaces in the west: Palace of Eternal Longevity, Palace of Earthly Honor, Palace of Gathered Elegance, Palace of Eternal Spring and Palace of Auspice (Hall of Taiji). Currently, Palace of Earthly Honor, Palace of Gathered Elegance and Hall of Taiji are open to the public. (1) Palace of Earthly Honor was the residence of Emperor Wanli's biological mother and the residence of Emperor Longqing's consort Li. But the most well-known person was Consort Nian of Emperor Yongzheng. (2) Palace of Gathered Elegance was once the residence of Empress Dowager Cixi who was known as Consort Yi. And she gave birth to Emperor Tongzhi there. After visiting the six palaces in the west, you can go towards north to enter imperial garden and you can leave the Forbidden City from Gate of Divine Prowess. There are 13 wing rooms on each side of the Meridian Gate which look like goose wings, and that's the origin of their name. The progressive layout which formed a square with wing rooms was influenced by the political system of Three Meetings and Five Gates at the time, aiming to show the dignity and majesty of imperial architectures. The tower was built in the 18th year during the reign of Emperor Yongle, and rebuilt in both the 4th year during the reign of Emperor Shunzhi and the 6th year during the reign of Emperor Jiaqing. Since 2013, the architecture was restored by the Palace Museum and completed in 2015. The exhibition hall of the east Wild Goose Wing Tower has a drawing of Emperor Kangxi's birthday celebration on display, which is 39.39-meter (about 129 feet) wide with a total of 18,000 characters in it. It is even larger than the famous drawing “Along the River During Qingming Festival”. In the drawing, you can find important points of interest in Beijing, such as the West Four-archway Building, White Tower of Beihai Temple of Eternal Peace and Beihai Round City and so on. You can get a wireless headset for free at the entrance and then you can listen to the description of every artifact in display, just don't forget to return the headset at the exit. 1) The first one is Jingshan Park, which is located immediately north of Forbidden City. You get a full panoramic view of the entire palace complex at the top of the hill. 2) Another good place is the corner watchtowers of the Forbidden City. On a calm day, the reflection of corner towers in the moat at sunset is on every photographer’s bucket list. There are two corner towers at each side of the Gate of Divine Prowess, I recommend you go to the northwestern one. Tickets of Jewel House and House of Clocks and Watches are each ￥10 per person. Now tickets to the Forbidden City can only be purchased online. Ticket purchasing on-site has been discontinued. The tickets can be purchased ten days in advance until they are sold out. You can book the tickets on the official website of the Palace Museum. Each Chinese ID card or passport can only buy one ticket one day. After purchasing tickets online, you can go in to the Forbidden City with your Chinese ID card or residence card without picking up paper tickets. People who bought tickets together need to check in to Forbidden City together. The Palace Museum is open all year round but the opening hours are different in low seasons and high seasons, and the opening hours can be extended or shortened on statutory holidays. The Palace Museum is closed on Mondays round except for statutory holidays and summer holidays (July 1st - August 31st every year). Note: high season refers to April 1st to October 31st; and the low season is November 1st to March 31st. 1. First, tickets of the Palace Museum need be purchased using real names, there is a limitation of 80,000 people per day. So bring your ID with you or you may not be allowed to enter. 2. Second, regarding restrooms, you can find restrooms (not many visitors on weekdays) on each side of Taihe Gate after safety check. Besides, you can find restrooms at the entrances of both the west and east six palaces. Restaurants and restrooms as well as relaxation rooms can also be found beside Jewel House and House of Clocks and Watches. Also there is a restroom in the Imperial Garden. 3. Third, tour routes in the Forbidden City are unidirectional, which means all visitors should enter from the Meridian Gate in the south and exit from the Gate of Divine Prowess in the north. Thus, a well-arranged route is necessary to save time and energy. In Beijing, subways are very convenient and well developed. So the easiest way for you to get to the Forbidden City is to take metro Line One and get off at the Tiananmen East station. Go out from the northwestern exit and walk to the ground level. Then you can see Tiananmen Tower in your front left. 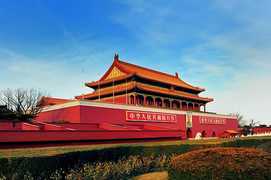 Pass through Tiananmen and Duanmen and go straight, and then you will see the Meridian Gate. You can also take buses to get there. Bus No. 1, No. 2, No. 52, No.59, No. 82, No. 99, No. 120 as well as Sightseeing Line 1, Night Line 17, 1, 2 and Special 2 can all take you to the Tiananmen East station, and you just need to walk for about 900 meters to get there. There's no parking lot around the Forbidden City and the public parking lot is far away. So you'd better not drive here. Besides the Forbidden City, the following attractions are also very popular among visitors, such as Badaling Great Wall, the Summer Palace, National Swimming Center, Bird’s Nest, Wangfujing and Prince Gong’s Mansion and so on. Transportation to the Great Wall is not very convenient, it will take you about an hour to get there since the buses are often crowded. Therefore, you can book a one-day tour with a professional interpreter so that your trip can be easy and comfortable. However, you should be careful about tour flyers distributed on the streets because you may be ripped off; instead, you should book your tour from a trusted channel to avoid scams.